What is it? The Old World holds many evils bent on the destruction of man & elder races. When your party arrives in Schompf, the odour of decay and Chaos digs its tendrils into your senses and draws you into one of the most beloved fantasy settings in tabletop gaming. Will Warhammer Quest delve into the caverns and tunnels below this festering city and return triumphant with loot or will it simply curl up and be left forgotten among the thousands of those that have gone before? Warhammer has been a setting I’ve fantasized about for many years. I used to page through Warhammer Monthly admiring the art and miniatures until fellow video gamer introduced me to Gotrek and Felix, the Tales of a Dwarven Slayer determined to find glorious death by constantly battering himself against seemingly overwhelming foes paired with a human bard. I was fascinated with the thematic elements of despair and races struggling against the chaos that Warhammer embodied in it’s low fantasy setting. Without the enthusiasm for crippling outlays of imported Games Workshop miniatures nor the inclination to invest large quantities of time into an RPG adventure, it appeared that these quests might not be suited to my gaming talents. 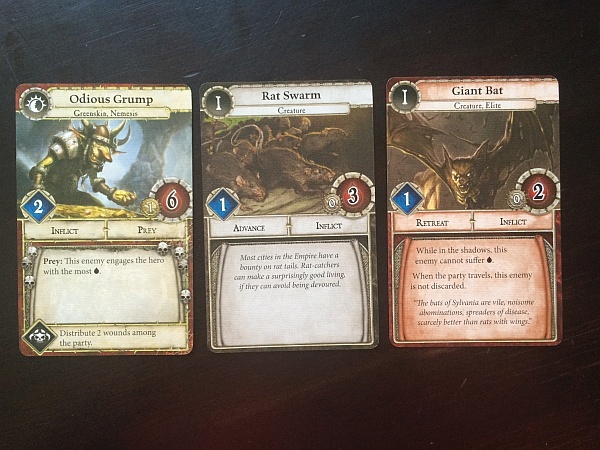 That was until Warhammer Quest: The Adventure Card Game glistened from a box beneath a local game store shelf. From Fantasy Flight Games, Warhammer Quest: The Adventure Card Game (WQACG) is a cooperative dungeon crawl in a card game format that can be played solo or with up to three friends. As your party of an Ironbreaker Dwarf, Elven Watcher, Human Warrior Priest of Sigmar and Bright Wizard follower of Aqshy arrive in the town Schompf, you realise the taint of Chaos is tangible. Each player will pick their hero of choice as they party up in the local tavern in an Uneasy Alliance (the core box campaign) while a local rat trapper tell you of an odour emanating from a sewer entrance he has passed on his rounds. As this tale hints at a clue as to why the local populace has fallen ill from the water supply, these wandering heroes need to group together for the sake of the town. Our Waywatcher is suited to sniping from far, exploring the depths while aiding party members in damage. 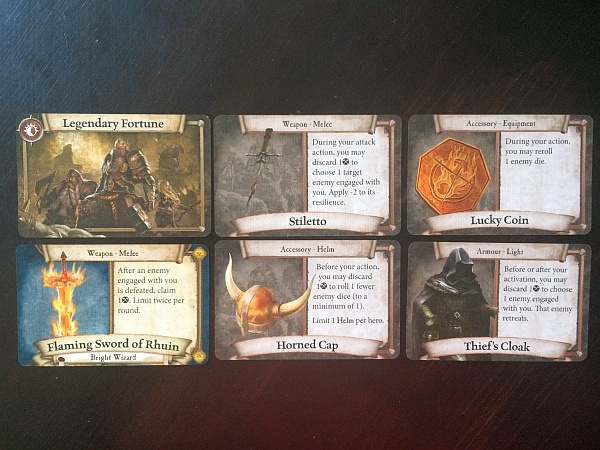 In each of the 5 quests that make up a campaign, players will select their chosen hero and receive their 4 action cards; Attack, Explore, Assist and Rest. An exploration deck will be constructed with various subterranean locations according to the quest difficulty level and an assortment of monstrosities will be accrued in the enemy deck relevant to the quest area. “But where’s the loot?” I hear you cry before abandoning your tavern mug. Rest assured each area has a random assortment of treasures waiting to be discovered along with a variety of location events that the party will experience while exploring locations. The objectives of your quest are outlined and players start at the sewer entrance, taking their last breath of “fresh” air before entering the bowels of Schompf. Loot Glorious Loot! Legendaries and a variety of commons all exist in the sewers. Each turn players will be activating one of their four available actions by tapping the matching card and rolling the number of dice equivalent to their prowess indicated on the card. Exploring represents players searching for items and adds search tokens equal to their successes to the location, which once it reaches the card’s threshold allows them to move to the next location. Resting lets players replenish hit points dealt from engaging with the denizens of the sewers, while assisting allows characters to grant other party members with success tokens, which they can discard to add to the number of success on their chosen action. Lastly, attacking simply deals out vast amounts of damage to the multitude of beasts that will be swarming and gnashing for your throat every step of your quest. Once you’ve used an action, you wont be able to re-use that particular skillset until you’ve used your refresh action (each character has one of his 4 actions that allows them to untap all the other used actions). 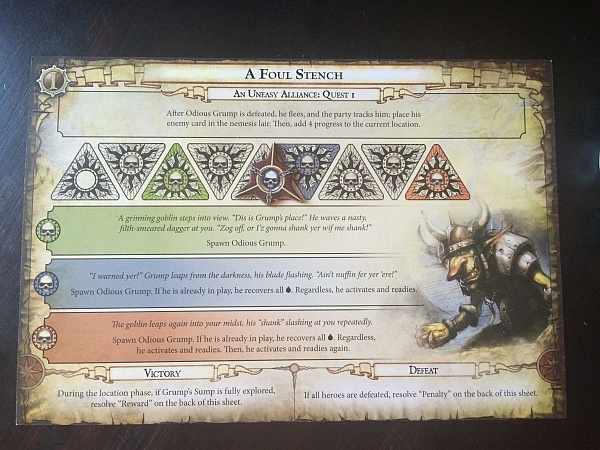 Each time players have had a round to activate their chosen action, the enemies in play will get to perform their actions in retaliation and the quest peril track will advance. The Peril is always too perilous! you’ll be racing against the clock to ensure your survival. The peril track is one of the standout points of the game mechanics in WQACG. 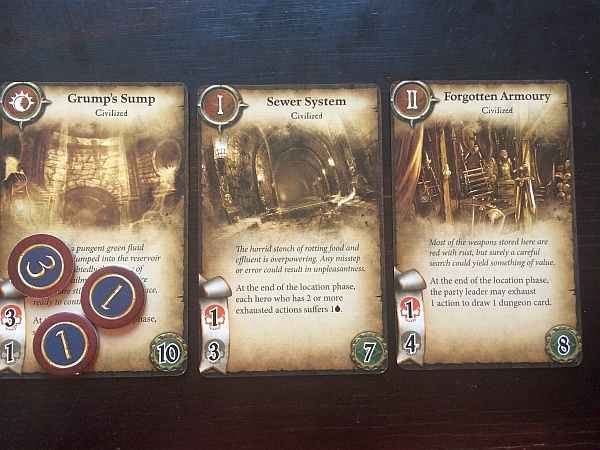 In the first quest, players are searching the sewers for the source of the pollutant, by exploring through the requisite number of passages to reach the final room which once they’ve successfully explored, secures them victory for the round. Each time they move to a different location, new monsters will spawn and attempt to maim our heroes who need to keep their chaotic populations in check through violent means while balancing this with the need to explore. The peril track is the catalyst to the urgency, as each time the marker moves forward, different story instances will occur, such as spawning nemesis characters with chaos in their veins to prey upon the party. The more turns you take to achieve the quest objective, the more dire your party’s chances become of success. And the forces of Chaos are relentless. The monsters in Warhammer Quest are varied in attributes to force you to deal with each in a different fashion. Warhammer Quest, similar to another FFG card game in their LCG line, is an exceedingly challenging game to say the least. The increasing difficulty is relentless with each attack from waves of monsters pummeling your heroes while they explore the depths of the city. Decisions of when to take a particular action to aid your fellow melee tank instead of resting to ensure he has the number of success to triumph could cause your own demise at the hands of a preying Skaven warrior. 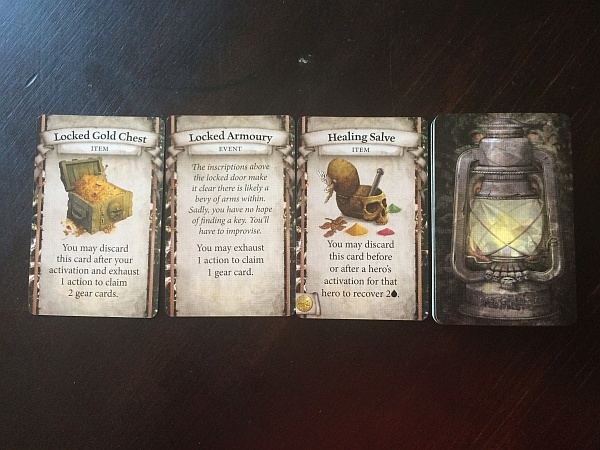 The game constantly reminds you that the odds are not in your favour, with dice rolls playing a large part in success or failure as well as what random locations get drawn, what types of loot you find in the random treasure deck and whether or not you draw two elite monsters in a single round and are forced to engage them both with your glass cannon spell caster. With so much relying on draws, dice rolls and what lies ahead, surely a game with that much masochistic tendencies cant be fun? A variety of events and loot mean that each dungeon is different no matter how often you replay the same quest. Yet there is something that makes me keep wanting to reset the decks when I get slaughtered and that calls to me when I see the box at the edge of my shelf. There is something in the challenge that makes every victory earned, every piece of loot found critical to your success and every dice roll that triggers multiple success for your character or the devastating nemesis ability of the Chaos champion brings cheers or groans to the table. The stakes for this type of game feel extremely high which I haven’t found in similar games of its ilk. Descent didn’t offer this tension that I feel when I’m drawing a new card to see whether we’ve entered a cavern of webs and are going to be delayed, when a rockfall is caving in around us, or when the elite Ghoul wanders into our path. In other games those instances have always felt to me to be a bit mundane, where in the Warhammer universe they can cleave your party without remorse. The system also has the benefit of replay value in the random nature of the setup, much like delving back into Diablo time and time again for new challenges and loot, WQACG will keep you replaying the Campaign or custom delve quest system numerous times. Different locations hold different challenges and need different skills to explore. I love the character development through the choice of using experience between missions to upgrade your character actions in the tavern. While all characters can do the four basic actions, the subtle nuances of prowess and additional characteristics accompanying each action make each character feel special and equivalently more so when you specialise through upgrading. Finding Legendary Fortune cards in the gear deck allows your character to find a mythical item designed to enhance their character and give a massive boost to the party, experiencing well thought out event cards that may add boons to or elicit boos from the party make the difference to each dungeon delve. Each quest, while needing you to explore for location completion tokens, attack to cull enemies in your path, aid to assist team mates with these tasks and resting to heal feels crafted into a unique tale, with peril conditions that guide players into a distinct play style for success. Whether its avoiding an ambushing goblin, chasing down a large orc escaping to his masters or dealing with sniping Skaven, they all feel different enough that you’re changing tactics and having a varied gameplay experience. The game’s difficulty will mean that its not for everyone and something that may put off a majority of board gamers due to the high impact that poor dice rolls and card draws will have on your chance of success. However, for players who love Warhammer Fantasy and weren’t put off by the difficulty and luck combination of games like XCOM, Warhammer: The Adventure Card Game is a system that embodies the low fantasy genre. You’ll find inside this box a story worth reading, a life and death battle that will make you cheer around a table or cry in anguish. 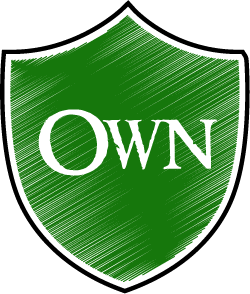 An important factor in the continued success of this IP will be the support it gets from Fantasy Flight Games in the form of expansion characters and additional quest to add longevity for owners of the core set. This is however FFG and we’d be very surprised NOT to see expansions announced soon. Warhammer Quest: The Adventure Card Game is a box of cooperative dungeon questing emotion that touches the peaks and troughs and will have you coming back for “just one more try”. If you hate the effects of luck in a game forcing you to fail, you may want to give this a pass, but if you love a fantasy dungeon quest that can be played alone or with friends or dramatic moments with a world that comes alive, don your armour and head to the sewers! Thank you to Skycastle Games for providing us with the demo copy with which to produce this review. 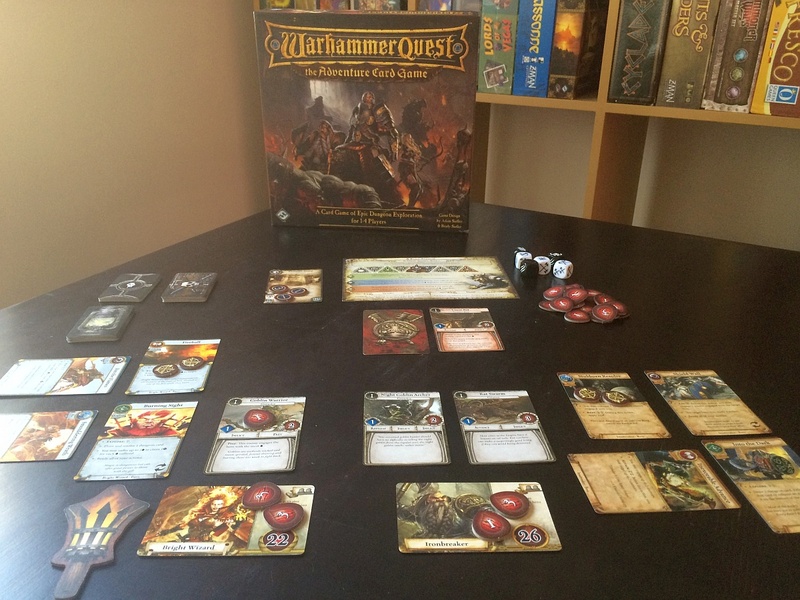 Warhammer Quest: The Adventure Card Game embodies so many elements I love in Thematic gaming. 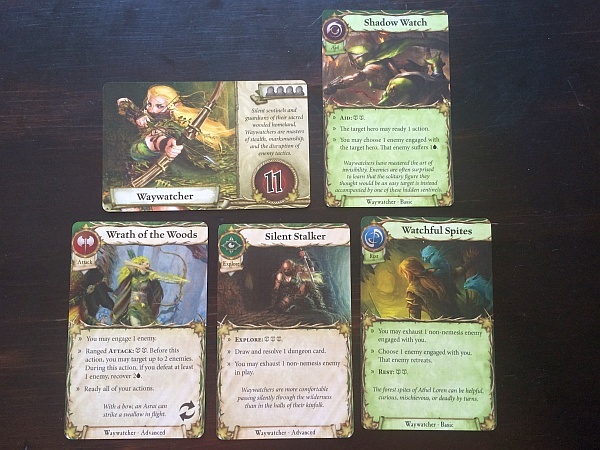 From subtle character progression, varied locations, great loot and interesting quests and monsters, this quick card game adventure improves on many elements that put me off from LOTR: LCG and Pathfinder Adventure Card Game. If you aren't a detractor from luck influencing your games, this may be the fantasy adventure you've been waiting for!